GRANNY’S HOUSE, A popular art installation that features at Electric Picnic, has been stolen. The yellow and pink coloured house – with an old TV and framed photo of the Pope – has been a favorite of festival goers looking to escape from the madness. The house features every year as part of Art Lot – a dedicated space at Electric Picnic that is curated by Dublin art collective The Glow Depot. John Kenny from The Glow Depot told TheJournal.ie that Granny’s House “became a sanctuary for people escaping the madness of the festival”. I think one person last year spent most of the weekend asleep in the armchair. He explained that they discovered it was stolen last week when they went to pick it up. It wouldn’t have a huge monetary value but a lot of effort went into it and whoever took it would have needed a trailer and a few people. Kenny added that there would be no animosity towards anybody who returned the house. There’s a good chance someone saw it and is using it as a garden shed, there would be no animosity towards that, in fact we would buy them a new garden shed. People are being asked to get in touch with The Glow Depot on Facebook if there are any sightings of the house. Email “Granny's House has been stolen from Stradbally ahead of Electric Picnic ”. 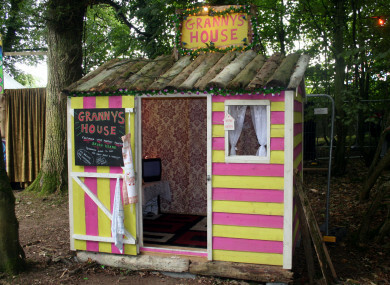 Feedback on “Granny's House has been stolen from Stradbally ahead of Electric Picnic ”.